Mr. Molina is a Senior Counsel who practices in the areas of civil litigation, insurance litigation, and insurance coverage. 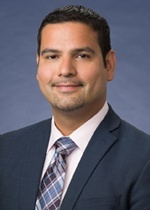 Prior to joining Martin, Disiere, Jefferson & Wisdom, Mr. Molina worked for a regional firm where his practice areas included international insurance defense and coverage, subrogation, personal injury / workers’ compensation, and Texas non-subscriber claims. Mr. Molina also has extensive experience with transportation claims, having served as National Counsel for a Class I Railroad, where he was responsible for the management of all aspects of litigation, including designing and implementing a cost-effective and efficient national defense strategy for all occupational claims. In his spare time, Mr. Molina enjoys being a mentor with the Katy I.S.D. K.E.Y.S. program as well as a Troop Committee member and Merit Badge Counselor for Boy Scout Troop 490. Mr. Molina is fluent in Spanish and Italian, and is familiar with French. Presented Defending Class Action Litigation Seminar at the XXIV National Association of Railroad Trial Counsel Special Litigation Conference, Snowmass Village, Colorado (February 7, 2014). Presented case study on Benzene Exposure and Diesel Exhaust at 26th Annual F.E.L.A. Occupational Claims Seminar, Boulder, Colorado (June 14, 2012).